Been looking for a break at this Hotel as it has amazing reviews and stumbled across a deal on SecretEscapes for £1050. Looked around and found it on Sunshine for £763. Surrounding dates go up and down by a few quid depending when your looking to go, but this is for the 15th September. Can also make it cheaper by going for the £20 shuttle, but included £70 private transfer in the price. With whole situation of ISIS and refugees (i like to think that most are economic migrants), who would want to go to Turkey? Perfectly safe in thsi area - Just have a look at the FCO website. Doubt you'll get many refugees at this hotel. Perfectly safe in thsi area - Just have a look at the FCO website. Doubt … Perfectly safe in thsi area - Just have a look at the FCO website. Doubt you'll get many refugees at this hotel. Don't kid yourself, why do you think it's so cheap! That's fair enough. I'll stick to the FCO advice though. I'm in Istanbul now - still entirely alive. Looks like this deal will stay in the freezer for whatever reason. Hopefully someone will stumble across it and find it useful though. Went to Lara beach a few weeks ago with the family and it was a lovely holiday. never felt unsafe. Bring a bullet proof vest and do not make any Limericks about Erdogan or you going to prison for disrespecting the despot, like that poor German comic. Yup, it's perfectly safe, the beach bars have their own rear gunners. It is only 'safe' until it gets attacked, then it's not safe...somewhere that is expected not to be safe, probably is safe. Take Egypt, it was thought to be "safe", now it's said not to be "safe" but it probably is the safest place in the world, at the moment because it is said not to be safe...clear? I don't let them stop me from going on holiday, been to Lanzarote in January and March, going to France in August and Rhodes in October. Not bothered about Turkey though at the minute. you would have to pay me and drag me kicking and screaming into turkey right now. it's just to unsafe being so close to Isis and a load of British holiday makers would be an easy target I'd rather not take the risk..
Turkey's a huge country. How close to the Syrian border do you think this is! I didn't ask how close you think this is to isis because we all know we have splinter cells in the country and the rest of Europe. Turkey backing Isis, please do not go. 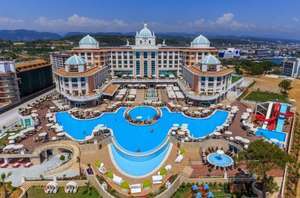 Ive booked Turkey for next month with my parter, 3 year old and 7 year old kids! As for it being cheap due to terror etc... this is utter rubbish too, there are hotels a few doors up from where I'm staying charging nearly £5000 for a week. I'm sorry, but the figures beg to differ. I realise most of these aren't in major tourist areas, but it's only a matter of time. The issue for me is, although I realise that the Turkish people for the most part are warm and friendly (I've been several times in the past), especially in the tourist areas, the country is 96% Muslim. I have absolutely nothing against Muslims, but ISIS supporters and sypmathisers come from Muslim countries and communities, ergo more Muslims = more ISIS. You're not 100% safe anywhere these days, but there are places like the Canary Islands, Portugal, Greece, Bulgaria, Croatia etc that offer less risk. I'm sorry, but the figures beg to differ. … I'm sorry, but the figures beg to differ. https://en.wikipedia.org/wiki/List_of_terrorist_incidents,_January%E2%80%93June_2016I realise most of these aren't in major tourist areas, but it's only a matter of time.The issue for me is, although I realise that the Turkish people for the most part are warm and friendly (I've been several times in the past), especially in the tourist areas, the country is 96% Muslim. I have absolutely nothing against Muslims, but ISIS supporters and sypmathisers come from Muslim countries and communities, ergo more Muslims = more ISIS.You're not 100% safe anywhere these days, but there are places like the Canary Islands, Portugal, Greece, Bulgaria, Croatia etc that offer less risk. I think that's very narrow minded. Anywhere is at risk, the whole point of the attacks are to be in the element of surprise! With many of the previous attacks, local Muslims have been protecting the tourists. Bookings in turkey are down 60% this year due to these worries from tourists. The Turkish residents around the country will be doing their up absolute best to keep tourists coming back as this will impact their economy in a huge way. Dubai is a Muslim country and I don't see people using this excuse about travelling there?! Jetski in the private pool? I think that's very narrow minded.Anywhere is at risk, the whole point of … I think that's very narrow minded.Anywhere is at risk, the whole point of the attacks are to be in the element of surprise!With many of the previous attacks, local Muslims have been protecting the tourists.Bookings in turkey are down 60% this year due to these worries from tourists.The Turkish residents around the country will be doing their up absolute best to keep tourists coming back as this will impact their economy in a huge way.Dubai is a Muslim country and I don't see people using this excuse about travelling there?! You can think whatever you like. I am prepared to pay a little more, to take my family to a place that is statistically safer than Turkey, in the current climate. I think people taking their family, especially children to a place that has a higher risk of terror attacks than somewhere else just to save money is downright irresponsible, but please feel free to justify it by calling people who disagree with you 'narrow minded'. There have been over 35 terror attacks in Turkey this year, claiming around 150 lives and injuring several hundred more. There haven't been any terror attacks in Spain, Portugal, Bulgaria, Croatia, Italy, Holland etc. There were 5 terror attacks yesterday, all in countries with Islam as the major religion. 2 were in Turkey. Call me whatever you like, but the stats overwhelmingly suggest that there are 4 terror attacks in Muslim countries to every one in non Muslim countries. I appreciate that the local 'decent' Muslim communities in these areas will do their utmost to make you you feel welcome and safe, but for me, it's not enough. They did their best in Sousse, Tunisia last year, and should be given medals. But 38 holidaymakers still died. As previously said. Turkey is a huge country. Its like saying you wont goto Edinburgh because there was an attack in London. As previously said. 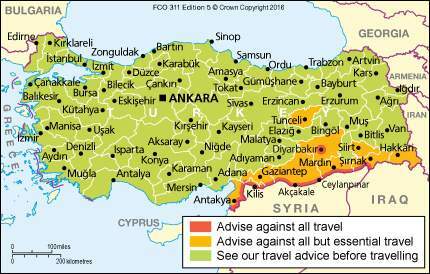 Turkey is a huge country.Its like saying you wont … As previously said. Turkey is a huge country.Its like saying you wont goto Edinburgh because there was an attack in London. So you only intend to stay securely locked away in your hotel grounds sitting by your hotels private pool? That doesn't sound like too much fun. So you only intend to stay securely locked away in your hotel grounds … So you only intend to stay securely locked away in your hotel grounds sitting by your hotels private pool? That doesn't sound like too much fun. Well if I see a jetski tearing up the road i'll be mighty impressed and remember to share a photo. Thanks for posting op,re Sunshine,I usually use Alpharooms,but checking dates for Turkey at a hotel we usually go to there is approx £100 saving,prices have taken quite a downturn,which is obviously due to perceived security problems,but as I live in Istanbul life just goes on,enjoy your holiday,out of interest have you used Sunshine before? Thanks for posting op,re Sunshine,I usually use Alpharooms,but checking … Thanks for posting op,re Sunshine,I usually use Alpharooms,but checking dates for Turkey at a hotel we usually go to there is approx £100 saving,prices have taken quite a downturn,which is obviously due to perceived security problems,but as I live in Istanbul life just goes on,enjoy your holiday,out of interest have you used Sunshine before? First time ive used Sunshine. Everything seems to have gone smoothly with the booking though, and very reasonably priced compared to elsewhere. Sunshine holidays are a very good company and can be 100% trusted. I always used to book with Travel republic & Alpha rooms but in the last few years Sunshine have been cheaper and I have booked with them about a dozen times without any problems. But please remember they are only a middle man and the actual hotel room is supplied by another company and will be named on your hotel voucher (eg beds with ease) so if that company goes belly up it Sunshine will have to get it sorted out for you.